Let's give a listen to another episode of "The Magic of Music", originally broadcast on Mutual. In this week's show, program 44 from the Armed Forces Radio and Television Service run of the program, the King Sisters drop by to promote their new album, "Imagination". Since this is the AFRTS, we hear an informative commercial about NATO. The show was digitized from an original AFRTS vinyl microgroove transcription. It's dated May 16, 1958 in the matrix, but I'm not sure if that's the original broadcast date or when the master for the AFRTS pressing was made. Let's give another episode of "The Magic of Music" a spin. This late-era otr show featured musical guests talking about their latest albums and was transcribed in Hollywood and sponsored by the Marine Corps Reserve and Recruiting. Originally broadcast on Mutual, the show features host Bob Osterburg and his singing theme song. In program 43, our guest is Don Nelson, the brother of bandleader Ozzie Nelson, promoting his lp, "The Wind". The conversation includes some discussion of unusual orchestral instruments in jazz and one of the tracks on the album features a solo on recorder. 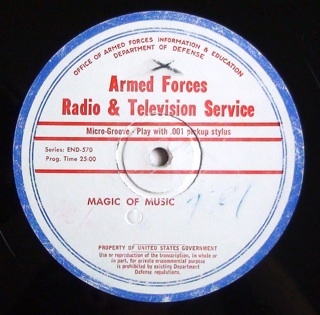 This is a rebroadcast of the series on the Armed Forces Radio and Television Service, so we hear some psas about NATO. The show was transcribed from an original AFRTS vinyl transcription dated May 9, 1958 on the matrix. 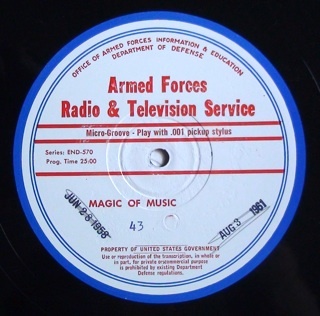 Now for a bit of music and chat with "The Magic of Music", a show transcribed in Hollywood for the Marine Corps Reserve and Recruiting and originally broadcast on Mutual. Program 42 of the series as broadcast on AFRS, features guest Kathy Barr promoting her new album "Follow Me". Barr was one of several female vocalists of the fifties that felt at ease with more sultry and uptempo material. She was brought to the attention of RCA by Mario Lanza. You guys out there might be saying "hubba hubba" when you take a look at the cover of the album. The show includes informational AFRTS announcements about NATO for the troops. Our program was transferred from an original AFRTS vinyl microgroove transcription. It's dated May 2, 1958 in the matrix, which could be the date the show was recorded, originally broadcast on Mutual, or the date this version was mastered by AFRTS engineers. This week, we premiere a new series on the blog, "The Magic of Music", that appears to not be in circulation among otr enthusiasts. "The Magic of Music" featured a musical guest who is interviewed about their work and a new album they're promoting. The series concentrated on jazz and vocalists and includes lesser known artists from the period; there are no performances in the studio, but we hear excerpts from their albums, some that are hard to find today. The show was transcribed in Hollywood for Marine Corps Reserve and Recruiting and hosted by Bob Osterburg - love the singing opening to the show that includes the host's name. 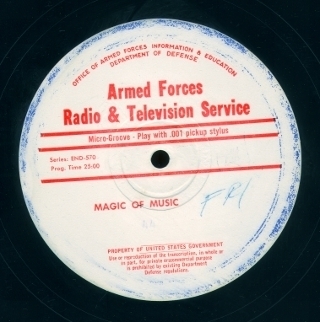 Mackenzie's "Directory of the Armed Forces Radio Service Series" seems to imply this was an AFRTS originated series, but one of the programs I have in the series mentions that the show originates on Mutual. Program 40 in the series as broadcast on AFRTS features vibes player Terry Gibbs talking about his career and album "Swingin' With Terry Gibbs". The show includes an AFRTS informational announcement about NATO. The show is dated April 18, 1958 in the matrix, so that could be the date the program was recorded, the date of the original network broadcast, or even the date it was mastered by AFRTS - the dates are less consistent on these later transcriptions. The show was transferred from an original AFRTS vinyl microgroove transcription with an episode of the "Jimmy Wakely Show" on the other side. I'll drop in a few episodes of the series in the next few months on the blog.